Prepare to be Amazed with one of our most popular tours. Visit the best highlights in Athens and then drive by the spectacular Athenian Riviera to visit the temple of Poseidon, the god of the sea at Cape Sounion. 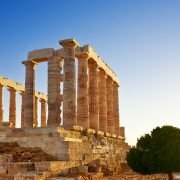 Enjoy with our Athens & Cape Sounion tour the best highlights of Athens and spectacular temple of Poseidon. Visit the architectural masterpieces and Acropolis hill, afterwards drive by the Athenian Riviera foresee the scenic coastal road that offers wondrous view of Saronic Gulf while passing through the most splendid suburbs of Athens and visit the Poseidon’s Temple. Enjoy one of our most popular tours!